Harry (Henry) Arthur Clifton was born on 5 September 1874 at Sussex, son of Thomas Henry Clifton and his wife Madeline Diana Elizabeth Clifton (nee Agnew). Lieut. H. A. Clifton served in South African war in 1899-1902 as Adjutant to Bethune's Mounted Infantry from 5th Oct. 1900 to 31st May 1902; took part in operations in Natal 1899; was present at relief of Ladysmith, including actions at Colenso and Spion Kop; on Tugela Heights; in Natal March to June 1900, including action at Laing's Nek; in the Transvaal June to 29th Nov. 1900 and 30th Nov. to Dec. 1900; in Orange River Colony Dec. 1900 to May 1901; and in Cape Colony May 1901 to 31st May 1902 (Medal with two Clasps). Clifton was commissioned as a 2nd lieutenant in the 7th Dragoon Guards on 19 May 1900 and promoted to lieutenant on 13 May 1901. He was promoted to the rank of captain on 21 January 1908, at the same time being appointed adjutant to the North of Ireland Imperial Yeomanry. He continued in this role with the North Irish Horse on its formation in July 1908, and remained with the regiment until the end of 1910. Clifton rejoined the army on the outbreak of war in August 1914, being appointed captain in the 7th Dragoon Guards Reserve of Officers, and soon after a major in the 1/1 Scottish Horse. On 2 September 1915 he landed, with his now dismounted squadron, at Suvla Bay. He was appointed temporary lieutenant-colonel on 22 November. With the abandonment of the Gallipoli campaign, Clifton left for Egypt at the end of December. His service was later recognised with a Mention in Despatches. While at Suvla, Clifton had contracted a bad case of dysentery, which troubled him through 1916. In July he was invalided home. He recovered well, and by February 1917 was again fit for duty. He was made staff captain in the War Office on 5 June and Deputy Assistant Adjutant General on 1 December 1917. He was disembodied on 14 January 1919 and resigned his commission on 21 January 1921. When Britain entered the Second World War Clifton rejoined the army (aged 65) and was appointed Major (Brevet Lieut-Colonel) in the Yeomanry. There is a record that Clifton received a Military Cross, but I have not yet located further details. He died on 16 December 1947. 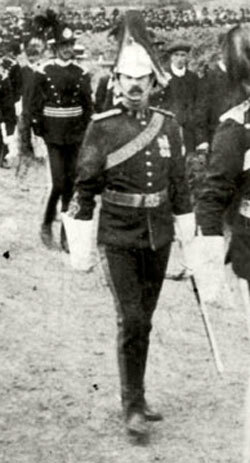 The above image shows Captain Clifton at a parade of the North Irish Horse in 1910. The full image can be seen here.